The first step in creating a new kayak is to identify a need in the market. Sometimes the need is obvious because people are asking for it or because there are distinct trends in the market. Other times, it just comes down to inspired thoughts and a gut-feel for what the market might need, even though the market doesn’t know it yet. Once clear parameters are set for a new kayak, such as its intended use, a ballpark for the physical dimensions and the size and weight range of the likely users, I get started with the actual design. I often get asked how I actually design a kayak, meaning how I decide what the boat should look like. I use a combination of my theoretical knowledge of fluid dynamics and my practical knowledge based on testing many different designs on the water for many years (my own past boats as well as those by other good designers). Of course, two designers with the same practical and theoretical knowledge will not necessarily create the same boat, so the final design also comes down to the designer’s personal taste and flair. I design all new products on a 3D CAD program (Rhino 5), which is great for surface modelling. Every design follows the same basic steps. 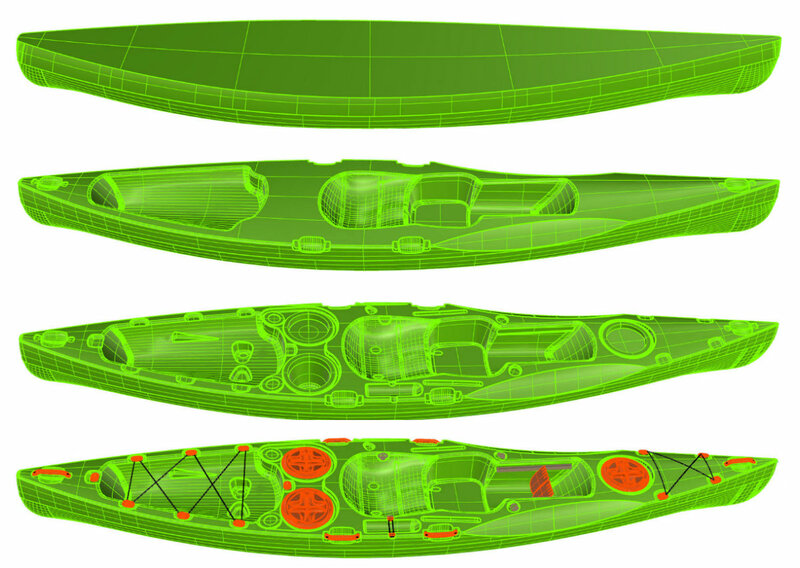 First, I create base curves, which are then used to create the main surfaces of the hull and deck. This is a critical step in the process, as the main surface of the hull will determine the actual performance of the finished boat on the water. The main surface for the deck is important too, as it will determine the eventual profile of the boat. Once the main surfaces are created, I design all the main cavities, such as the seat and footwell, as well as the tankwell. Then follows the detailed layout of the deck, figuring out what fittings to use and what configuration will work best. Once the configuration is finalised, I create all the little recesses for the fittings. CAD drawing development of the Kasai. With the CAD design finalised, it is time to create a physical representation of the design, called a plug. The first step is to turn the 3D CAD design into G-code that can be read by a CNC machine. On CAD, I cut the design into smaller pieces to fit onto our CNC machine, and then use a CAM program (Cut 3D 1.11) to create the G-code. (Left) Section of the Kasai digitally ‘cut’ into a smaller piece for cutting on the CNC machine. (Centre) Tool pathways. (Right) Visualisation of the cut foam. We use our own in-house CNC machine, which I built too, to cut the plugs. The plugs are cut from urethane foam blocks, which are soft enough for fast cutting but has a cell structure that is fine enough for detail. Foam first undergoes a rough cut and then a slower, more detailed cut. After cutting, the foam pieces are put together to create a full-scale plug. This plug is then finished off with a variety of different materials until it has a smooth finish. At this stage, I often make some modifications by hand on the foam plug. Plug of the Kasai deck with the pattern for the Kasai hull visible in the background. From the plug we create a fibreglass mould, which we call a pattern. We use the pattern to make a prototype fibreglass kayak, which we test on the water. Depending on the application of the kayak, we take the prototype for flatwater paddling, ocean paddling/surfing and/or paddling rapids on rivers. I always try to get my partners’ input during the testing phase, as they have a wealth of paddling experience between the four of them. When needed, I also bring in other experienced paddlers to testing sessions to get their feedback. Not all good paddlers are good test paddlers, so I am quite selective about who I invite to test. Depending on what I learn from the prototype testing, the pattern will either be finished off completely, or altered to make a second prototype. If testing really didn’t go well, I go back to the CAD design and start all over again. Once I’m completely satisfied with the design, the pattern is sent off to a foundry, where aluminium replicas of the pattern pieces are cast. When we receive the aluminium casting back from the foundry, a lot of manual labour goes into turning the castings into a mould. The rough casting surface must be polished, porosity pockets and other glitches in the casting need to be welded up, different casting pieces are welded together, the top and bottom parts of the moulds need to be bedded in (because the castings deform during the cooling stage at the foundry), and steel brackets and clamps must be fitted. When the aluminium mould is complete, it is mounted on the rotomoulding machine and a test boat is moulded. More often than not a few more glitches are discovered during this stage. These are corrected before the new design is ready to go into full production.